I have been trimming the Hydrocotyle sp. ‘Japan’ once per week, selling off 60-100 cm at a time. If you want some, send me an email or leave a message! The H. leucocephala, which can be seen growing at the centre front has been moved to the back now. The Lindernia rotundifolia has also started to take off, and since I took the first cutting two weeks ago, a couple more stems are now close to the surface, so I expect to cut them back next weekend or the weekend after. All of the Cryptocorynes are growing well, although slowly, with C. beckettii ‘petchii’ being the fastest. I have even managed to find some Rotala rotundifolia cuttings which are recovering slowly! Mosses are also doing well. While I originally added only Vesicularia ferriei, the weeping moss has sprouted strands of Taxiphyllum sp. ‘peacock’ and there are a few strands of what I suspect to be T. sp. ‘stringy moss’, which is also sometimes labelled as ‘Japan moss’. Another couple of hitch-hikers have also made it into the aquarium: Hemianthus callitrichoides ‘Cuba’ and Riccia fluitans. The Riccia is not doing so well, while the Hemianthus has gotten caught on one of the C. beckettii ‘petchii’ leaves and seems to be growing. Both species are often considered difficult or impossible to grow in “low-tech” set-up, so it will be interesting to see how these do. 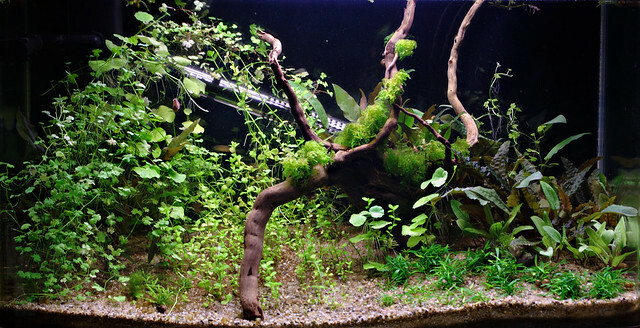 The Pogostemon erectus is surviving, although no longer doing well. I added a root tab underneath it a couple of days ago and moved it out from under the C. wendtii ‘Tropica’, which had started trying to grow over the Pogostemon. After taking the photo, I pruned back all the Hydrocotyle sp. ‘Japan’ from around the heater as I did not like how it looked and gathered the L. rotundifolia closer together, towards the back of the aquarium.